Mens Deer Antler Ring made of Tungsten and Real Deer Antler. 8mm width, comfort fit ring so that it feels good on his hand. The rugged hammered edge on this ring makes a perfect fit for a man who isn't afraid of getting his hands dirty. This ring is the perfect choice for men who hunt. No more worrying about getting him the right ring and if he will like it or not, this is it. This is an awesome ring for men that spend time in the wild, comes with a lifetime warranty on the tungsten, and is sized accurately. 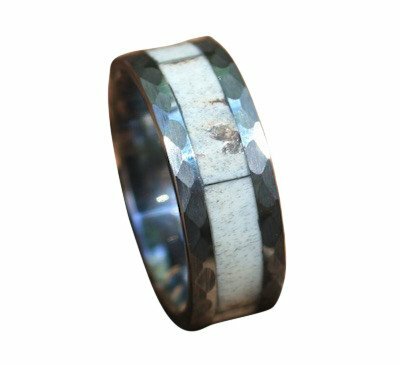 TUNGSTEN & REAL DEER ANTLER ring for Men - The hammered edge shows a rugged look for a man who isnt afraid of getting his hands dirty. Hypoallergenic. Comfort Fit. EXCLUSIVE RING- We design and make each ring by hand, individually. Finally, you found a cool ring at an affordable price that he will love. STRONG RING - Comes with a Lifetime Warranty on the metal. Antler is sealed with a solid resin inlay shielding the ring from the elements. It is still recommended to keep the ring out of water for the longest life. These are natural materials. BUY CONFIDENTLY - Check out our 5 star reviews. We offer a no hassle 30 day 100% money back guarantee.Resizing Fee of $20 for any exchange greater than a 1/2 size difference. Please size at a jeweler in advance. Resizing Fee of $20 for any exchange greater than a 1/2 size difference. Please size at a jeweler in advance. NEED A SIZE 13.5, 14, 14.5, OR 15? NO PROBLEM. ORDER ANOTHER SIZE AND THEN MESSAGE US. If you have any questions about this product by SureFire Designs, contact us by completing and submitting the form below. If you are looking for a specif part number, please include it with your message.